Life is a constant buzz, however, at Bentleys of Blackpool we can offer you flexible accommodation whether it is for business, pleasure or spontaneous travel. Ideally located and near enough from the North Pier on the fashionable North Promenade and the town centre with its world famous tourist attractions, conference venues, theatres, attractions, nightlife and shopping for you to take advantage of all that Blackpool has to offer. But far enough away from the crowd so that you can have space to relax and breathe. Bentleys of Blackpool is open all year round offering a warm welcome, whether you are in Blackpool for 1 night or a few nights. You'd be hard pushed to find a better location than Bentleys of Blackpool, as it is 1 minute away from Blackpool North Train Station, within walking distance of Blackpool Coach/Bus Station and Blackpool International Airport is only 3km away, as well as the benefit of excellant local transport links. Bentleys of Blackpool offers great value. Prices from £15. 00 per person per night. Whether you are organising a meeting, conference, party, training event or require private dining in a central location. Bentleys of Blackpool may have the space for you. 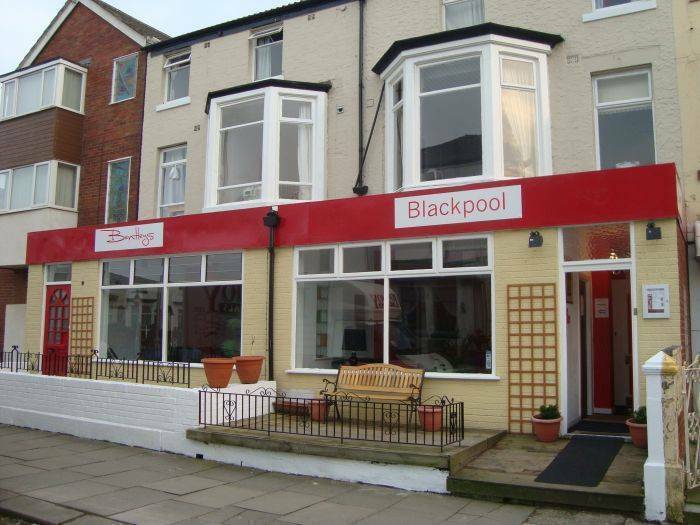 Ideally situated in the North Shore area of Blackpool, only minutes away from Blackpool North Train Station and within walking distance of Blackpool Bus Station. Bentleys is open all year round offering a warm welcome to business people, tourists and those just visiting for a few days. All of our rooms are equipped with:- Colour TV’s with remote control and Freeview. Hairdryers. Clock Radio’s. Direct Dial Telephones. Hospitality Tray. Freshly laundered linen & towels. WiFi throughout. Full Central Heating. There will be no cancellation charge if the booking is cancelled before 10am BST 1 day before the date of arrival. If the booking is cancelled later, or in the case of a no-show no refund will be applicable. With many attractions Blackpool has to offer Bentleys is your ideal base as it is close to theatres, the Winter Gardens as well as the town centre shopping areas, Bentleys is also ideally situated for anyone wanting to visit Funny Girls.